Key and Peele is the brainchild sketch comedy of Michael Keegan and Jordan Peele that is arguably one of the funniest, socially accurate comedies on television right now. So when it was revealed that Jordan Peele was directing his first movie, I was excited for an extended version of one of their sketches on the big screen. Get Out is not that. 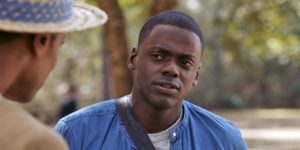 Get Out is a masterful, poignant commentary on institutional, subtle racism disguised as a horror movie. The main character Chris, played by Daniel Kaluuya, who is going to meet his girlfriend, Rose’s, played by Allison Williams, parents for the first time. Right off the bat Chris asks if his girlfriend’s parents know that he is a black man, Rose laughs his question off as if it is the silliest thing in the world to be concerned about Rose’s parents’ reaction when she brings him home and then says not to worry because her father would have “voted for Obama a third time,” a micro-aggression that is supposed to be comforting but really just makes everyone uncomfortable and doubt that he’s actually not racist. Without spoiling too much the movie incorporates more social justice themes while creating the thrill and fear of a horror movie. Peele’s natural comedy comes through in many parts of the movie, especially in Chris’ best friend the TSA agent Rod. I cannot do the experience of watching Get Out justice in an article, the experience requires a packed theater, buttery popcorn and the collective laughter and screams of the movie. Peele has also come out and now blessed us all with the information that Get Out is in fact the first of the trilogy that speaks to social justice issues in a different, more palatable context. Peele turned a tiny budget of 4.5 million dollars into easily one of the best movies of the year. I highly encourage everyone to go see Get Out, the movie will highlight the subtle problems in our society for those who were aware of them, and for those who weren’t, the movie is enlightening. Peele packs the 1hr and 40 minute movie with references to black history, racism, micro-aggressions, psychology, thrillers, horrors and you will leave the theater wary of the world around you. And if you don’t want to go for Peele’s genius, go to see the beloved Daniel Kaluuya who also acted in an episode of Black Mirror and was Jal’s brother in the U.K. Skins. If nothing else go to understand pop culture and all those Get Out memes and challenges. Junior Jesika Islam is the Arts & Leisure Editor. Her email is jislam@fandm.edu.